The temporal distribution of tremor activity exhibits a highly non-Poissonian behavior, and its maximum period of non-Poissonian clustering statistically describes the recurrence interval of major tremor bursts. Here, we examine variations in the temporal clustering properties of tremor activity by assessing their characteristic times, which are determined by the maximum period of the non-Poissonian distribution. By applying a two-point correlation integral to some of the world's major tremor zones, including Shikoku, Kii-Tokai, and Kyushu in Japan; Cascadia, Jalisco, and Guerrero in Mexico; southern Chile; Taiwan; and Manawatu in New Zealand, we reveal local spatial variations in the temporal clustering properties in each tremor zone and show global-scale variations in tremor activity. The spatial variation in local tremor activity is characterized by a gradual transition in the along-dip direction and shorter-wavelength heterogeneities in the along-strike direction, possibly associated with a spatial change in frictional conditions at the plate interface and rheological conditions in the surrounding materials. The characteristic time correlates positively with locally measured median tremor duration, implying an inherent correlation between the moment release rate and the recurrence interval of tremors. Deep tectonic tremors are small-amplitude, long-lasting seismic events that occur in a belt-like zone at around 20- to 40-km depth and have been observed in various tectonic regions since their first discovery in southwestern Japan by Obara (2002). These seismic events are considered to represent successive small shear failures at the plate or fault interface in the transition zone from stick-slip to stable sliding (e.g., Beroza and Ide 2011). The temporal pattern of tremor occurrence has been characterized as ‘episodic’, consisting of short-period burst-like activity separated by long periods of inactivity. Previous studies have reported that the episodic pattern of tremor activity changes spatially throughout a tectonic region. For example, in southwestern Japan, Obara et al. (2010) detected two different modes of tremor activity in terms of recurrence period, depending on tremor depth. In the Cascadia subduction zone, Wech and Creager (2011) showed that tremor activity gradually changes from burst-like (episodic) to continuous with increasing depth. A similar depth-dependent transition has been reported for tremors along the San Andreas Fault at Parkfield, California (Shelly and Johnson 2011). Such spatial heterogeneities in tremor activity are considered to reflect mainly the frictional regime at the deep plate interface (e.g., Obara et al. 2010). These previous studies described the large-scale, depth-dependent variations of tremor activities, either qualitatively or using some specific criteria. In addition, the nature of global-scale variations in tremor activity in terms of episodicity and occurrence patterns remains poorly understood owing to the lack of assessing the local tremor activity in a quantitative way. A more robust investigation can be made by measuring the local clustering property of tremor activity in an objective manner. 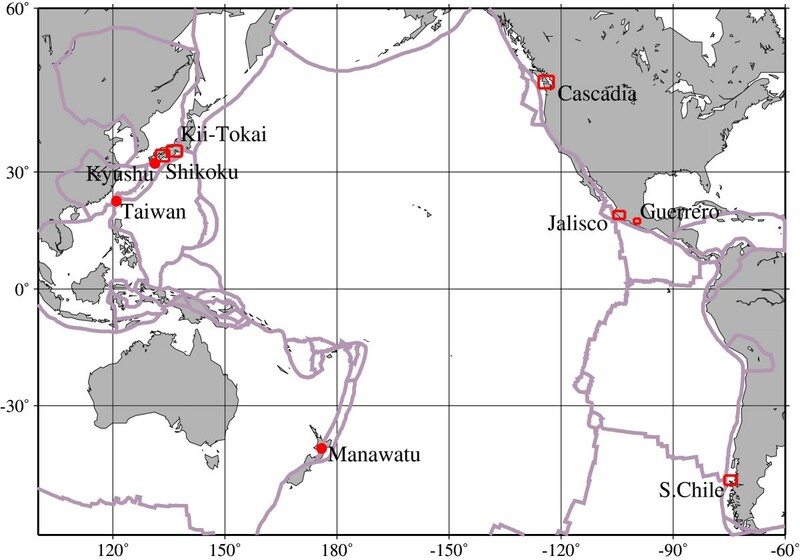 In this study, we characterize the temporal clustering properties of tremor activity in major tectonic zones worldwide, based on the non-Poissonian behavior of tremor occurrence using the tremor catalog constructed by Ide (2012) with some updates (Figure 1). The map of the circum-Pacific region. The areas enclosed by the red rectangles or pointed by the red dots show the regions we have studied. Plate boundaries are denoted by thick gray lines (Bird 2003). Tremor activity with episodic and burst-like occurrences can be expressed as a non-Poissonian process. Figure 2a,b shows examples of cumulative tremors with time and the frequency distribution of consecutive interevent times (hereafter referred to as ‘waiting times’) for three different tremor patterns: episodic (left), modestly episodic (middle), and continuous (right), for the tremor subsets in Shikoku (the location of each subset is indicated with a circle with a cross in Figure 3). When assuming a Poisson process in which an event occurs randomly at a constant rate λ, the waiting time (Δt) follows an exponential distribution expressed as Pr(Δt) = λe−λ Δt. In contrast, a typical tremor activity shows a clear bimodal distribution, corresponding to the waiting times within each burst in periods of Δt < 1/λ and those between the bursts in periods of Δt > 1/λ, where 1/λ is the average period of event occurrence. This type of bimodal distribution of event occurrence is quite common in a natural system where events occur spontaneously and triggered by prior events at different time scales (Wu et al. 2010). In the case of tremor activity, the bimodal distribution is likely to be associated with a quasiperiodic cycle of stress accumulation-release upon the deep plate interface and a short-period cascading of events induced by the diffusion of stress (Wech and Creager 2011). Examples of cumulative events, waiting time distributions, and correlation integral plots. For the temporal distribution of tremors for subsets in Shikoku. Each example corresponds to the episodic (i, left), moderately episodic (ii, center), and continuous (iii, right) cases (corresponding bin locations are shown by circles with crosses in Figure 3). (a) Cumulative event distributions for the three cases. The total number of events is shown in the upper left corner of each diagram. 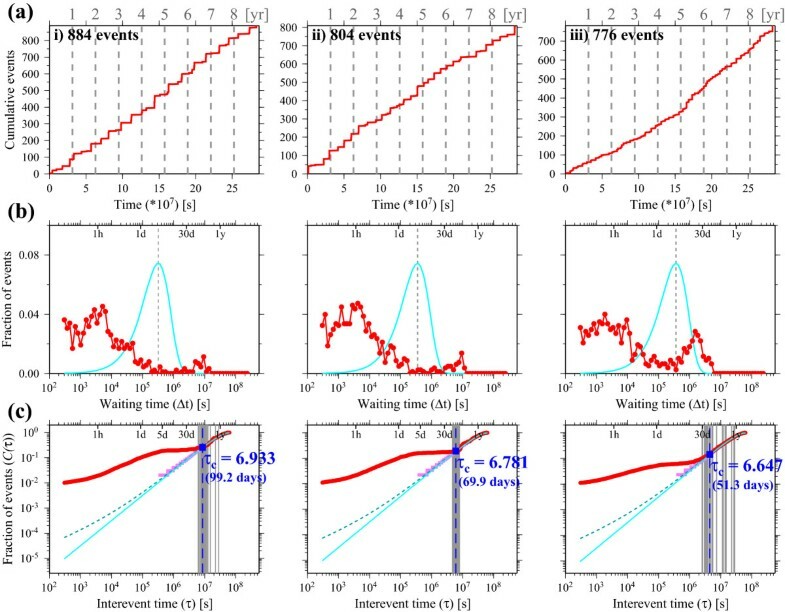 (b) Distributions of waiting time (t i − ti − 1) corresponding to each of the tremor subsets. The points along the red line denote the point-wise frequency distribution of the waiting times for each subset. The light blue lines show the frequency distribution for a Poisson distribution. The vertical dashed line is the average period of the recurrence interval (1/λ). (c) Correlation integral plots for the three cases. The points in red show the correlation integral plot of tremors for each example. The light blue lines show the frequency distribution for a Poisson distribution. The pink lines show the frequency distribution for a periodic distribution. The light blue dashed lines denote the 0.01 level of significance (χ 2 test) for a Poisson distribution. The labeled, dashed lines show the value of τ c determined by our analysis. The gray lines show the time periods of the maximum non-Poissonian clustering determined for the different time frames by random sampling. Tremor distributions for the studied regions. Tremor depths are color-coded according to the diagram for Shikoku. Light blue triangles denote the seismic stations during the total observation period. Circles with crosses and roman numerals for Shikoku correspond to the locations of the tremor subsets shown in Figure 2. Each white and black dot with a number (or number only for Kyushu, Taiwan, and Manawatu) denotes the location corresponding to the cumulative events (white and black dots) and to the correlation integral analysis (white dot only) shown in Additional file 1: Figure S1. The circle with a cross in Shikoku, Kii-Tokai, Cascadia, Jalisco, and southern Chile denotes the spatial size of each bin applied to each tremor zone (see Table 1). For the tremors in Guerrero, the tremor subsets close to the stations were used for the analysis. For the tremors in Kyushu, Taiwan, and Manawatu, the tremors plotted in each map were used. The insets in the bottom right of the diagrams for Guerrero, Kyushu, Taiwan, and Manawatu show an enlarged view of each tremor region. P k , τ = e − λτ ⋅ λτ k k ! Examples of the correlation integral for the temporal distribution of tremors are illustrated in log-log space in Figure 2c. Typical tremor activity is characterized by short-period burst activity that can be fitted by a power-law distribution, C(τ) ∝ τ γ , followed by a period of inactivity, and then long-period activity that is fitted well using a Poisson or a periodic distribution. The pattern of C(τ) of the tremor activity reflects the episodic nature of tremor occurrence: a quasiperiodic burst activity of tremors lasting up to 1 to 10 days and a subsequent period of quiescence lasting to several months. In case (i) as an example, C(τ) increases approximately linearly on a log-log scale by up to approximately 5 days, corresponding to the short-period burst activity, succeeded by longer periods of inactivity lasting up to the periods where the C(τ) of tremor activity is fitted with that of the Poisson distribution, which is recognized as the characteristic recurrence time of the quasiperiodic tremor activity. Similar patterns are observed in cases (ii) and (iii) except for the shorter periods where the tremor activity follows the Poisson distribution. Here, we define the characteristic time, τ c , which is determined by the maximum time period over which C(τ) of the tremor activity differs from the Poisson or periodic distribution. More detailed definitions are given in the next section, in which we assess the local properties of temporal clustering by evaluating the values of τ c in tectonic regions worldwide using tremor catalogs. We applied our analysis to real tremor catalogs compiled for tectonic zones worldwide. Tremors were detected and located using an envelope correlation method coded by Ide (2010) and compiled for Shikoku, Kii-Tokai, Kyushu, Cascadia, Jalisco, and southern Chile by Ide (2012). Some of those catalogs were updated for this study. We also included tremor zones in Taiwan, Guerrero, and Manawatu (New Zealand). All the catalog data used in this study are available from the website (http://www-solid.eps.s.u-tokyo.ac.jp/~idehara/wtd0/Welcome.html). The time spans of these catalogs are listed in Table 1. We measured the duration of a detected tremor as the half-value width of the stacked envelope waveform for many stations and extracted tremors from the catalogs with durations longer than 10 s, residual errors within 1.5 s, and event depths between 10 and 50 km (source locations are shown for each tectonic zone in Figure 3). where Npair is the number of event pairs for the correlation integral (i.e., Npair = N0(N0 − 1) / 2) and Ctrem(τ) and Cpois(τ) are the correlation integrals for the tremor activity and the Poisson distribution, respectively. The maximum time period was determined by linear interpolation of the point-wise correlation integral plot. We repeated this process 100 times by extracting different time frames from the whole time span in a random manner (the extracted time span is given in Table 1). The value of τ c for the tremor subset is determined by the median value of maximum non-Poissonian time periods evaluated for each process. The value of τ c determined by this procedure is illustrated for each bin in Figure 2c. Note that τ c is shown on the common logarithmic scale. τ c performs well in describing the local tremor activity having continuous (low τ c ), modestly episodic (middle τ c ), and episodic (high τ c ) modes of tremor occurrence. Additional file 1: Figure S1 shows examples of the analysis for each tremor zone. It should be noted that we do not examine the cases where the tremor activity shows gradual, long-term changes or where it accelerates or deactivates nonperiodically. These nonperiodic bursts/quiescence may make the τ c values become saturated at around the designated time span. As such, our approach is not likely to be applicable to tremor regions with a recurrence interval longer than the entire time span of the catalog, with a long-term slow-slip event, with an irregular spatiotemporal distribution of seismic stations over the observation, or with a long-term change of tremor activity as a result of preslip/afterslip. In this study, we applied our method to only those tremor subsets with constant burst activities during the observations. Moreover, we took the value of τ c as the median value of 100 maximum time periods of non-Poissonian distributions from different time frames, thereby mitigating the effects of nonperiodic bursts or quiescence in the entire catalog. Based on these criteria, we excluded the following regions from the analysis: central and southwestern Jalisco and southern cluster of Guerrero, where the total time spans of the catalogs are shorter than the burst recurrence intervals (#14, #16, and #22 in Additional file 1: Figure S1), and southernmost Chile, where the distribution of seismic stations is not spatiotemporally uniform over the observation. Figure 4 (left) shows spatial variations in τ c for tremor activity in tremor zones worldwide. In Shikoku and Kii-Tokai, a significant transition in τ c is inferred in the dip direction of the subducting slab, with some heterogeneity in the strike direction. An along-dip transition between continuous activity on the downdip side and episodic activity on the updip side is consistent with previous observations (Obara et al. 2010). Along-strike heterogeneities, showing various spatial scales with shorter-wavelength changes in τ c , partially correlate with localized seismic velocity anomalies, especially in the localized region of the southwesternmost Kii-Tokai (Akuhara et al. 2013). The segmentation of short-term slow-slip events seems to correspond with the larger-scale pattern of the along-strike heterogeneities of τ c in Shikoku and Kii-Tokai (Sekine et al. 2010). These results indicate that local structural heterogeneities and along-strike segmentations, as well as a depth-dependent variation in temperature, are likely to affect the behavior of tremor activity. An along-dip or depth-dependent transition is generally observed in the broad tremor regions, although it is much more prominent in Cascadia than in other tremor regions where along-strike heterogeneities are more spatially extensive. In Jalisco and southern Chile, the tremor activity is largely continuous. Distributions of τ c and frequency distributions of τ c for each region. 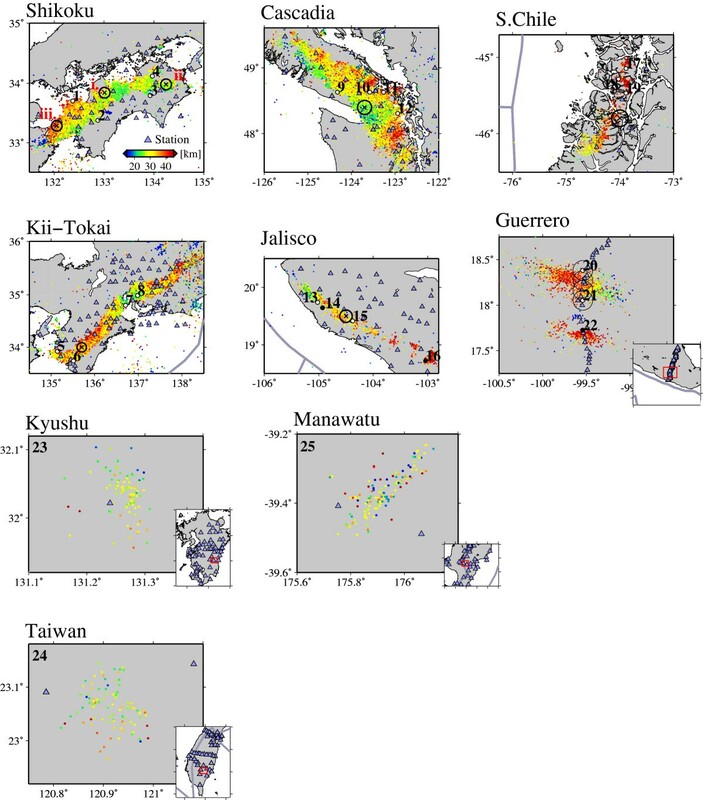 (Left) Distributions of τ c (the interval of a non-Poissonian tremor activity) for Shikoku, Kii-Tokai, Cascadia, Jalisco, southern Chile, and Guerrero. The values of τ c are color-coded according to the diagram for Shikoku (top panel). Gray dots denote the tremors in each region. Plate boundaries are denoted by thick gray lines. The iso-depth contours for the subducting interfaces are denoted by thin black lines for Shikoku, Kii-Tokai (Ide et al. 2010), Cascadia (McCroy et al. 2006), and Jalisco (Pardo and Suarez 1995). (Right) Frequency distributions of τ c for each region except for Guerrero. Dashed gray lines with notations in each panel represent the typical scales of periods. The gray areas for Shikoku, Kii-Tokai, Jalisco, and southern Chile show the periods longer than the respective extracted time spans. Histograms of τ c are shown in Figure 4 (right). The amplitude of τ c , corresponding to the recurrence interval, differs significantly among different tremor regions. In Shikoku, several peaks are identified at periods around 6.6 to 6.8 (approximately 50 to 80 days) and 6.95 (approximately 100 days), corresponding to the recurrence intervals on the downdip and updip parts of the subducting slab, respectively. The recurrence interval of the updip part of tremor activity in Shikoku (approximately 100 days) and it bimodal distribution is roughly consistent with Obara et al. (2010). A short-term peak of 50 to 80 days is less prominent for Kii-Tokai, and this is also consistent with the observations of Obara et al. (2010). 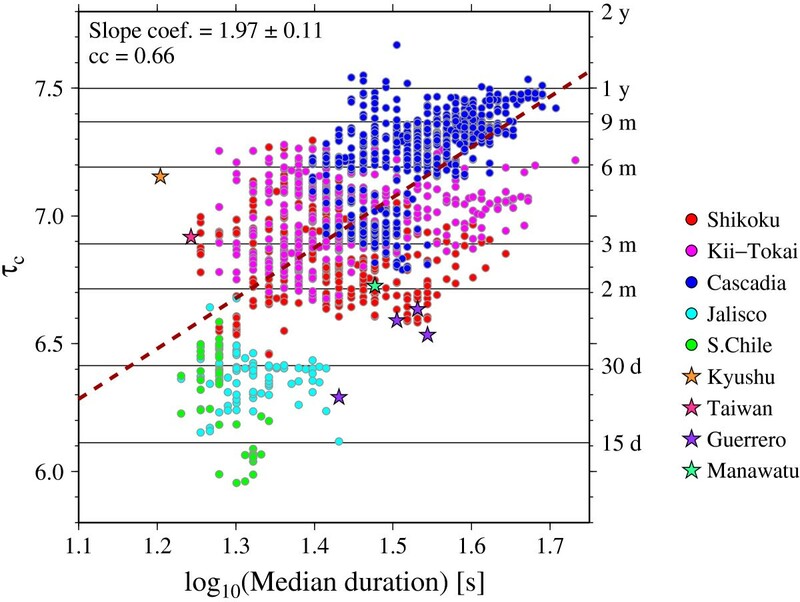 Peaks at around 4 to 6 months for Kii-Tokai likely reflect variable recurrence intervals along the strike of the subducting slab, corresponding to the along-strike segmentation of short-term slow-slip events (Sekine et al. 2010). The largest values of τ c of around 1 year are seen in Cascadia, confirming previous reports of a very long recurrence interval of over 1 year (e.g., Rogers and Dragert 2003). In contrast, very small values of τ c of around 10 to 30 days are predominant for Jalisco, the northern cluster of Guerrero, and southern Chile. The τ c values evaluated in Cascadia seem shorter than the well-established occurrence interval of the episodic tremor and slip (ETS) events of 13 to 16 months (e.g., Rogers and Dragert 2003), which is because τ c accounts for the minor bursts during the inter-ETS periods. In spite of several inconsistencies between τ c and qualitative measures, measuring τ c has several advantages to compare with the tremor activities having various different activity styles. A moderate but a statistically significant positive correlation is observed between τ c and tremor duration (Figure 5). As tremor duration is proportional to the seismic moment release of corresponding slow earthquakes (Ide et al. 2007, 2008), the positive correlation suggests that the size of tremor events increases as the recurrence interval increases. The negative correlation between tremor duration and sensitivity to tidal stress (Ide 2012) also implies that the recurrence interval is long in cases where tremors are less sensitive to tides. These observations are consistently explained if the frictional strength at the plate interface is heterogeneous and controls tremor occurrence. It is important to note that the difference of arbitrary parameters in measuring τ c shown in Table 1 as well as the local noise levels in tremor detection possibly causes some minor bias in comparing among different tectonic environments, but it would not cause any significant changes in the relationship between the τ c and the duration in the global variations. Distribution of the median tremor durations measured for each subset with τ c . The different regions are shown by color-coded circles (for the broad tremor regions) and color-coded stars (for the localized tremor regions). The brown dashed line is the least squares best fit regression line. The time scale of 15 and 30 days; 2, 3, 6, and 9 months; and 1 and 2 years is denoted on the right side. The slope coefficient with 95% confidence interval and the correlation coefficient are denoted on the top left. The tremor subsets for the localized tremor zones of Guerrero, Taiwan, and Manawatu are within the range of the τ c -duration plots (Figure 5) for the broad tremor zones. A clear exception is the subset for Kyushu, in which the tremor duration is anomalously short with respect to the recurrence interval. The tremors in Kyushu occurred in the region where the Kyushu-Palau ridge has supposedly subducted (Yabe and Ide 2013), perhaps resulting in a greater proportion of the accumulated stress being relieved aseismically by intertremor bursts whereas the frictional strength at the plate interface is locally high (Scholz and Small 1997). There are several limitations and possible artifacts that must be considered when estimating τ c . First, we discuss the effects of two a priori parameters on the estimation of τ c : the bin size and the extracted time span. The distributions of τ c for the different bin sizes (bin radii of 5, 10, and 15 km) and the time spans (1 to 3 years) are presented in Figure 6. Values of τ c are basically insensitive to bin radius within the bin size applied. On the other hand, τ c determinations seem to be more sensitive to differences in the extracted time span. A time span shorter than the recurrence interval of tremor bursts results in a highly deviated τ c value, saturated around the designated time span. In contrast, a time span much longer than the inherent recurrence interval of periodic tremor bursts may be affected by the longer-period or nonperiodic activity, resulting in a τ c larger than the actual recurrence interval (Figure 6c). Therefore, the extracted time spans should be chosen carefully to include the inherent recurrence intervals of the tremor activity and to exclude longer-period variations or nonperiodic activity. In order to avoid possible biases from the short and long time span, we chose the shortest time span to obtain a robust τ c value for the tremor subset with the largest recurrence interval in a tremor region. At the same time, we did not change the extracted time span in a tremor region to avoid introducing any artifacts into the spatial variation. Distributions of τ c for Shikoku with the different bin sizes and extracted time spans. (a) Distributions of τ c with bin radii of 5 km (bottom), 10 km (middle), and 15 km (top). (b) Distributions of τ c with extracted time spans of 1 year (bottom), 2 years (middle), and 3 years (top). (c) Example of the variation in τ c for different time frames and the different time spans applied. 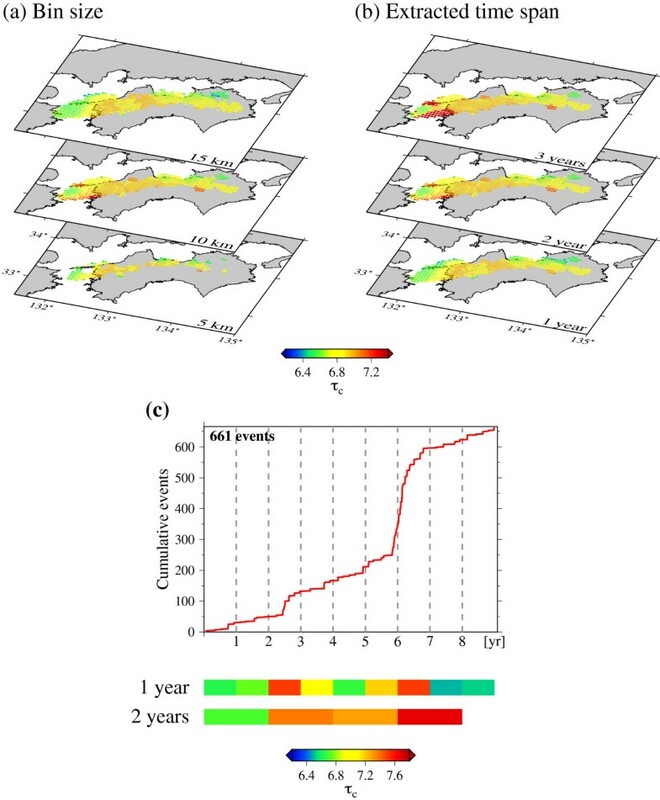 The top panel shows the cumulative events for the subset in Shikoku, with a nonperiodic burst between 5.9 and 7 years induced by a long-term slow-slip event. The upper and lower color bars show the temporal distributions of τ c determined using the 1- and 2-year time spans, respectively, with respect to the time frame corresponding to the cumulative events. Regarding the causes of spatial variations in tremor activity, along-dip variations are likely to be associated with depth-dependent variations in fault strength determined by thermal conditions, although they may also be related to depth-dependent stress transfer along the plate interface (Wech and Creager 2011). The along-strike heterogeneities found here, particularly the localized heterogeneities observed for Shikoku and Kii-Tokai, indicate that the local clustering properties of tremor activity are affected by several factors other than temperature, such as pore fluid pressure and geometrical irregularities, including subducting seamounts or oceanic ridges. A dynamic rupture model of small brittle patches on a viscous background (Ando et al. 2010; Nakata et al. 2011) may be helpful in explaining the observed diversity of tremor activity. The variety of the spatial patterns of tremor activity among the tremor zones studied here can be attributed to the maturity of the plate interface, which depends on the subduction history (Ide 2012). The present study had proposed a statistical method for estimating the characteristic time (τ c ) for tremor activity. This method should be readily applicable to tremor catalogs compiled for other subduction zones or for areas around active faults to reveal the spatial pattern of temporal clustering properties. The authors are very grateful to the editor David Shelly and three unknown reviewers for their critical reviews and helpful suggestions. This work was supported by JSPS KAKENHI (23244090). Data were obtained from data servers at NIED (Japan), the Canadian National Data Centre for Earthquake Seismology and Nuclear Explosion Monitoring, the IRIS data center, the Northern California Earthquake Data Center, and GeoNet (New Zealand). Figures were plotted using GMT (Wessel and Smith 1998). KI analyzed the data. SI and SY compiled the tremor catalogs. All the authors contributed to the interpretations and writing of the paper. All authors read and approved the final manuscript.